dance.net - Irish Dance Canvas (10168288) - Read article: Ballet, Jazz, Modern, Hip Hop, Tap, Irish, Disco, Twirling, Cheer: Photos, Chat, Games, Jobs, Events! I am looking to raise some money for a trip I'm taking in June. I was trying to think of some crafts I could sell that would have a low cost, but higher selling price. 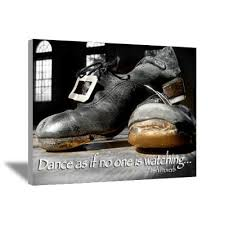 So I thought about making Irish dance photo canvases; my sister could take some pictures of my feet/dancing and I would only pay for the cost of getting the photos printed off, as well as the canvases (which I can buy at the $1 store) and Modge Podge for adhesive. What I'm wondering is how much you would recommend charging for the canvases, and whether you would purchase something like this. I've attached a photo (not my own; from Cafepress) of what I was thinking; the ones I make would not have the wording underneath, unfortunately. What a creative idea, I love it! I think selling price would depend on size, quality, and your target audience. How would you sell them? Online? Or would you create a little vendor's shop at craft shows? Who is your audience? People from your dance school, people you work with, family, etc? I looked up the canvases on cafepress and I find them over priced to be honest. I couldn't afford to spend $80 on a picture when that money could buy me a new wig or soft shoes and poodle socks! Or more practically speaking, pay a bill. I would charge between $20 - $50 and I think people would be willing to pay that, especially if it's going towards a trip you're taking (missions?). Good luck and I LOVE the idea! I would definitely consider purchasing if you were able to ship to the UK and if the photo appealed to me. I think a suitable background is key - if you've got plug sockets, wires, scruffy walls or whatever behind you, it can detract from the shot. Interesting lighting's good, too. As for the cost - start with a 100% mark up on what it costs you to make as a very minimum. If you're paying pennies for the raw materials I would say in the range of $20-$50 depending on size would be a good starting point and very attractive indeed to people. Perhaps you could do a kids range, smaller shots with added colour (like in the example shot - mostly black and white but with colour added. I'm sure there's a professional term for this but I have no idea what it is!) - and an "adult" range with slightly larger prints. Perhaps you could do sets of three as well - smaller squares that you buy and display as a set? - The canvases would both be flat canvases though, not the raised canvases. I *think* the Dollarama may sell that type....any thoughts on that? - I agree that the prices I saw when I did some research were far too high. I know they are probably wonderful quality, but Irish dance is expensive enough! And Louise, I also agree that my sister and I would have to work to ensure we got at least 2-3 good photos I could use; I love the simple, classic, artsy shots that speak for themselves. Any other feedback or thoughts? Thanks! I REALLY need to stop typing up DDN responses on my iPad, because it keeps deleting my entire response after I've typed it all up. Sorry if this is disjointed, I had a really nice paragraph all typed up and ready to go! - I also like the idea of photos without words, but why not offer both? - If you can do the prints on a made-to-order basis, you could have a certain number of photos for buyers to choose from, and then for an additional fee they could choose from a selection of wuotes to add on to it. This option allows you to have a lot of options while taking out the guesswork about what people will order. - You may want to look into selling your prints through Etsy. It makes the process a whole lot easier, and gets your products more exposure. I've been on Etsy for about a year now so I am happy to answer any questions you may have or help you get started. - Even if you don't sellon Etsy, they have a ton of resources including a seller's handbook that gives advice on everything from taking photos/presenting your product topricing your product. - Keep in mind shipping costs. I recommend charging shipping separately from item cost. - One idea may also be, if you have a costco membership, they do really good canvas prints at a good price. Mod podge + flat photo doesn't really equal canvas print. That's not a high quality way to do it, and I wouldn't recommend going that route it because people are probably going to expect the photo to be printed directly on the canvas. Real canvas prints are much pricier and should be sold more in the $30-50 range for the sizes you're talking about (I say this as a former professional photographer). Having said that you can get them printed very cost effectively at a local copy shop (or Costco, as was mentioned) as a bare minimum. The last time I had an 18X24 canvas print made the cost to me was around $35, which I sold for about $50-60 because my time in going to the shop, cropping the photo to fit and postage is valuable--and that was really on the cheaper end of things. I'd wager that you're selling these kinds of things mostly to dance parents, not skeint college students, so having some higher-end options probably won't hurt you if you do them to order. I suggest getting high-quality art prints made and just selling them as straight prints that people can frame as a more cost-effective option. But I really advise against the mod podge & canvas idea, because although it might look okay in your own home as a Pinterest project it probably isn't what people think of when they hear "canvas print", and I would hate for you to find out that you unwittingly misled someone. ^Thank you both for your replies and helpful feedback. I never thought about selling on Etsy, but that's a great suggestion that I'll certainly look into. I never thought about whether people might think I'm misleading them, but that's a good point. I do realize it wouldn't look as polished as the ones Costco or Walmart sells, but I don't know whether most families in my dance school would be able to afford $50 (for a 12x16" canvas, which would end up being a $20 profit). But I suppose if I offered the option to buy just the prints, in various sizes, then that might offer a wider selling net? Any suggestions on how much to sell the prints for? It looks like a 12x18" enlargement at Costco is around $3; would $10 be too much? Thank you all again SO much for your feedback! I love DDN! I like the idea immensly. You could be to Irish step dance what Degas was to ballet. A true artist. Good luck and let us know if you put anything on etsy. $10 would definitely be just right for a print. I hope you're very successful in this venture!